Federico Uribe’s colorful artworks transform ordinary pencils into abstract and realistic sculptures. Taking full advantage of the palette in a color pencil box, the artist turns the drawing medium into sculptural artworks. 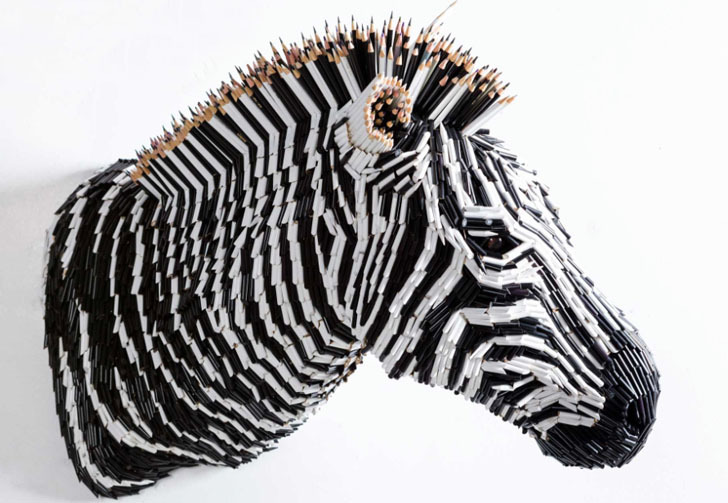 Often held together with zip ties, Uribe gives new purpose to pencils, using the wooden pieces to create mandalas, animals, people and abstract sculptures. Uribe is inspired by the reuse of everyday objects into art materials. For these sculptures, he challenges the conventional use of colored pencils, which are usually pressed to paper to create art, and transforms them into colorful building blocks for sculpture. Uribe uses pencil fragments of varying sizes to create sweeping geometric designs and curves. Held together tightly by zip ties, the body of the pencils are layered to create the illusion of a continuous tone. The pencils’ sharpened tips create pops of surprising beige to betray the illusion of the continuous color, as do the diagonally sliced pencil ends. The pencils are reconfigured into flat portraits on a canvas, or into three dimensional pieces. Pencils laid out in swirling patterns make up spherical forms, the varying colors becoming a gradation of one hue to the next. Uribe also makes realistic pieces, such as three dimensional animal busts and people. By looking beyond an objects original use, Uribe takes inspiration from the shapes and colors of everyday materials. The inspiring pieces celebrate the beauty of things we use in our daily lives. 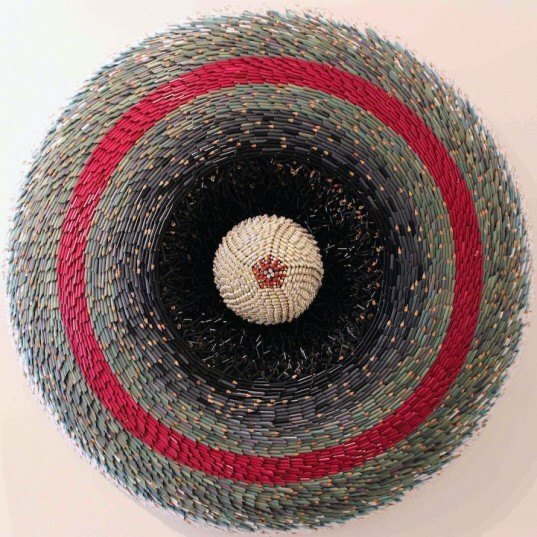 Uribe is inspired by the reuse of everyday objects into art materials. For these sculptures, he turns the table on colored pencils, which are usually pressed to paper to create art. Instead, the pencil’s use is changed, instead becoming a building block of a sculpture. Uribe uses varying sized pencil fragments to create sweeping geometric designs and curves. Held together tightly, the body of the pencils are layered to create the illusion of a continuous tone. The pencils’ sharpened tips create pops of surprising beige to betray the illusion of the continuous color, as do the diagonally sliced pencil ends. The pencils are reconfigured into flat portraits on a canvas, or into three dimensional pieces. Swirls of pencils make up spherical forms, the varying colors becoming a gradation of one hue to the next. Uribe also makes realistic pieces, such as three dimensional animal busts and people.